During the dark winter month of February, Monastiraki celebrates light and shadow in two exquisite exhibitions. In LUMEN, Peterborough, Ontario artist Laura Madera's small to large-scale watercolours on paper fill our gallery walls with subtle colour shifts and meditations on being present and open to what is. Featured in Monastiraki's gallery window for the month of February, Mere Phantoms will show a selection of their intricately beautiful, three-dimensional paper cut-out "sets" from recent installations in Turkey ( Oyuna Gel // Come out and Play, Istanbul Biennial, 2013 ) and Denmark (Three Cities: Prayer/Protest, Brandts Museum, 2014). As the sun goes down, the window will come alive in a play of shadow and light; a sure delight for passers by. The word Lumen means both a measure of the total amount of visible light emitted by a source as well as an opening, or light, within a body. With this collection of work Laura Madera takes the phenomena of light and unfolds it though subjectivity. 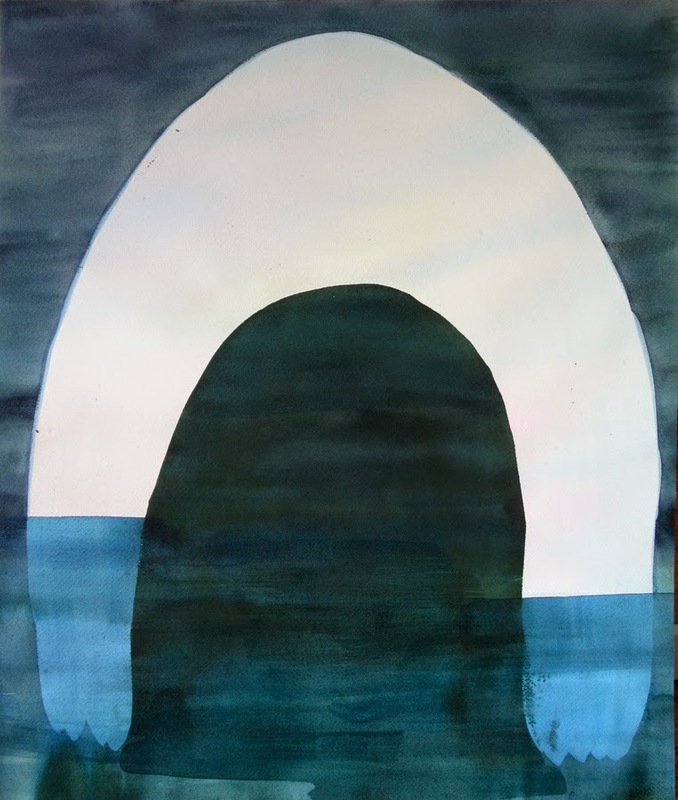 Using the properties of watercolour, she works toward occupying a metaphysical space. Taking her surroundings, materials, body and desires as starting points, she grapples with the beingness of being here now. Laura Madera received her MFA from the University of Guelph and a BFA from Emily Carr Institute in Vancouver, BC. Her work initiates with questioning, and what follows is the result of negotiating, probing, and conversing within a process of making. For Madera this unpredictable shifting process of understanding can only be arrived at through a physical engagement with materials. The outcom­e she works towards is a quality of openness in meaning - a painting that refracts thought. Content is something previously seen, thought, felt, dreamed of, which is then re-constructed or re-imagined through her studio processes. Madera's desire for these images to become paintings develops over time, slowly - out of a need to explore the edges and dimensions of the subject - a way to grasp in paint the seemingly ungraspable. Laura Madera's work is held in private collections across Canada, the United States and the United Kingdom. Born in Toronto, Madera currently lives and works in Peterborough, ON and serves as a member of the Board of Directors for ARTSPACE. Mere Phantoms takes the experience of shadow play to a whole new level. Based in Montreal and founded in 2009, the creative studio combines intricate paper cutouts, drawings, videos and animation to create place-specific installations and performances. By inviting audiences to participate in creating and animating the work, directors Maya Ersan and Jaimie Robson design immersive environments that challenge traditional artist-audience relationships. The creative practice that Ersan and Robson have been developing together since 2011 is inspired by shadow puppetry, animation, and early cinema, yet is distinct from these traditions. In traditional shadow puppetry the puppets are moved and animated from behind a flat screen, using a static light source to cast a shadow. 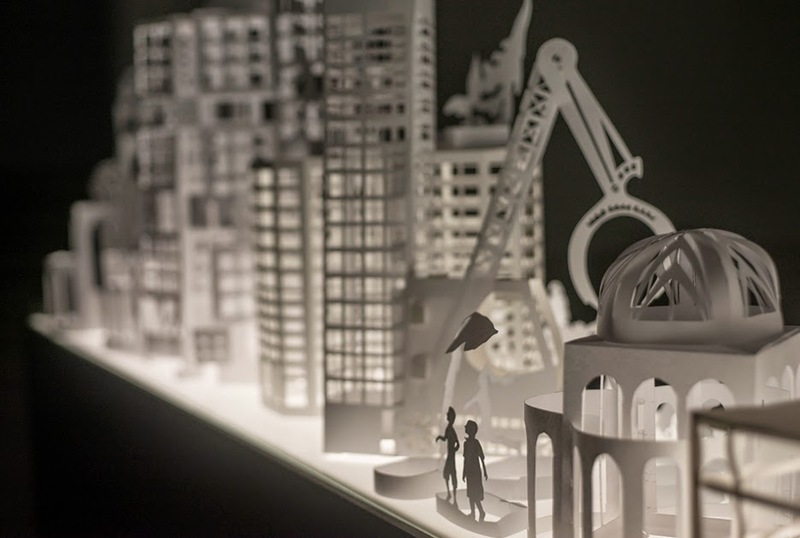 Ersan and Robson construct intricate three-dimensional paper cutout “sets” that are placed in front of the projection screen making them integral to the installation. By combining multiple hand-held light sources the artists and their public audiences animate the artwork, playing with the size, scale, and intensity of the layered shadows that are cast. Pendant la noirceur du mois de février, Monastiraki célèbre la lumière et l’ombre avec deux expositions exquises. Avec LUMEN, l’artiste originaire de Peterborough, Ontario, Laura Madera, emplit les murs de notre galerie de changements de couleurs subtils et de méditations sur l’art d’être présent et ouvert à ce qui se présente à nous, avec ses aquarelles sur papier en petit et grand format. Apparaissant dans la vitrine d’exposition de Monastiraki pour le mois de février, Mere Phantoms exposeront une sélection de leurs complexes et magnifiques ensembles de silhouettes découpées dans du papier provenant de leurs récentes installations en Turquie ( Oyuna Gel // Come out and Play, Biennale d’Istanbul, 2013 ) et au Danemark (Three Cities: Prayer/Protest, Musée Brandts, 2014). À l’heure du coucher de soleil, la vitrine prendra vie dans un jeu d’ombres et de lumière; un bonheur certain pour les passants. avec l’existence de l’être dans le présent. Laura Madera a obtenu sa maitrise en Beaux Arts à l’Université de Guelph et un BFA à L’Institut Emily Carr de Vancouver, en Colombie-Britannique. Mere Phantoms élève l’expérience des jeux d’ombres à un tout autre niveau. Basé à Montréal et fondé en 2009, ce studio créatif joint de complexes silhouettes découpées dans du papier, des dessins, des vidéos et l’animation afin d’élaborer des installations et des performances spécifiques à certains lieux. En invitant le public à participer à la création et à l’animation de l’œuvre, les directrices Maya Ersan et Jaimie Robson élaborent des environnements d’immersion qui remettent en question les relations traditionnelles entre l’artiste et le public. This month, January 2015, Monastiraki will be closed in order to turn an ailing, clogged and neglected backroom into a functional and inspirational studio space ! We will be open in February with a stunning window show and a stunning interor art show as well as more programming ! In the meantime we can serve you by appointment ! Call us during daytime business hours (514) 278-4879 to set up a visit.